A Chinese health expert has said that the country is likely to experience an upsurge in the number of human bird flu cases in the next month or two. Shu Yuelong, from the National Centre for Disease Control and Prevention, said China needed to work harder at preventing bird flu outbreaks. The warning came after the health ministry said a 16-year-old boy had died in central Hunan province. The human form of bird flu has now claimed three lives this year. An earlier BBC report said Mr Shu had suggested that China risked an epidemic in the next few months, but it later became clear that he was referring to an increased risk of an epidemic occurring. 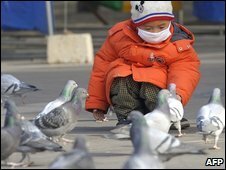 The BBC's Beijing correspondent Quentin Sommerville reports that winter and spring are prime bird flu seasons, when more than 70% of cases occur. If there is no avian flu outbreak in poultry and yet there are human cases, does this mean the virus has changed? Millions of Chinese people are heading home for Chinese New Year, increasing the chances of infection, he says, and in spring, migratory birds carry the virus over great distances. On Monday, the authorities announced that a woman in eastern Shandong province had died from bird flu. And two weeks ago, a 19-year-old woman died in Beijing after handling ducks. Meanwhile, a two-year-old toddler reported to have been in critical condition with the H5N1 virus has now recovered and is described as "stable". Chinese and Hong Kong media have been reporting that the toddler's mother had died this month after exhibiting symptoms similar to bird flu, but her death has not been officially blamed on bird flu. The upsurge in bird flu deaths on the mainland is causing concern in Hong Kong, where consumers have been told not to eat poultry brought in from the Chinese mainland. China's ministry of agriculture said on Sunday that no bird flu epidemics were detected in Shanxi and Henan provinces after the two-year-old's infection was confirmed. Hong Kong's secretary for food and health, Dr York Chow, said this was a cause for concern. "There are two main areas we are concerned about: one is that if there is no avian flu outbreak in poultry and yet there are human cases, does this mean the virus has changed? "Secondly, we are worried about whether there are more so-called 'slightly infected' chickens that actually might be carrying the virus and transmitting the disease, and yet do not show any symptoms or die from those illnesses," Dr Chow said. The ministry said China now faces "a grim situation" in bird flu prevention, threatened by frequent outbreaks in neighbouring countries, the Chinese state news agency Xinhua reported. China has the world's biggest poultry population and is seen as critical in the fight to contain the H5N1 strain of the virus, which resurfaced in Asia in 2003, killing at least 247 people. H5N1 does not transmit easily to humans but experts fear it could mutate and cause a worldwide pandemic.